Strung along just over 11 miles (18km) of rugged cliffs between Levanto and La Spezia, the UNESCO-listed Cinque Terre is one of Italy's greatest treasures. Cinque Terre means 'Five Lands'. These are the five related fishing villages that nestle precariously on the cliffs, overlooking the azure ocean of the Italian Riviera, off the country's northwestern coast. Cinque Terre is a picture-perfect dream of sparkling clear waters and dramatic vistas, contained within the tranquil embrace of the villages that are connected to one another by a scenic pathway that curves through the hillside among olive groves and vineyards. Monterosso is the largest of the towns and is recognisable through the huge statues carved into the rocks facing its shores. The village of Riomaggiore is quickly identified through the myriad fishing boats festooning its shores and is linked by the 'lovers lane' to the charming town of Manarola. 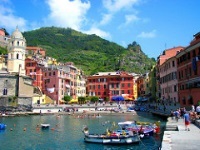 Corniglia perches precariously on the mountainside and is accessed through a steep climb, and Vernazza's promenade and piazza have beautiful sea vistas. A stroll along these dramatic cliffs is one of the most splendid walks in the country, and photographers will be captivated by the camera fodder. Cars and motorbikes are not allowed in the villages and Cinque Terre is part of a national park.